After manually entering the data from 528 double sided surveys collected at the Women’s March, we transitioned to fielding the survey on handheld tablets. The tablets make it possible to import the survey data as soon as the tablets are connected to Wifi. As a result, the dataset is in and all closed-ended questions are analyzable immediately. 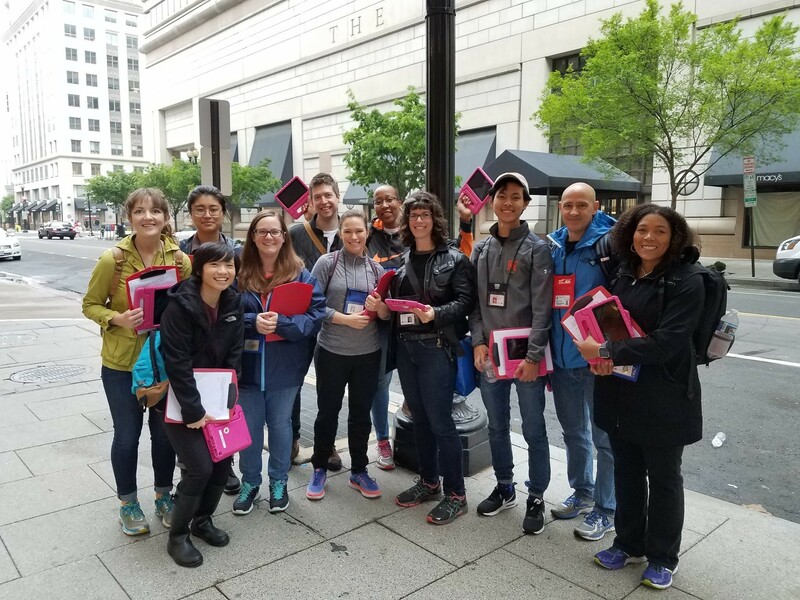 As we learned during the March 4 Science, tablets are not that much more sturdy than paper surveys in the pouring rain; I had to pull the research team early when the touch screens started freezing up. If the tablets die before the data are uploaded, all of our data is lost. At the People’s Climate March, which was hot and sunny, we found that sunscreen covered hands on touch screens slow down the input process (and make for a gross sticky screen). There is much to be learned from the surveys of protest participants, and the protesting populations vary in many ways. However, data collected so far has shown some heartening consistencies across these protests. The resistance is drawing a lot of new people to the movement. A third of the participants at the Women’s March reported never participating in a protest before, 30% were new at the March 4 Science, and 24% were new at the People’s Climate March. At the same time, participants at these marches are reporting attending previous events in the resistance: 45% of the participants at the March 4 Science and 70% of participants of the People’s Climate March had participated in the Women’s March. Although new people are coming into the movement, their engagement seems to be sustained, at least so far. The overwhelming majority of these new protesters also reported no connections to the organizations that were partners of the events they attended (including 400+ groups for the Women’s March, 100+ for the March for Science, and 500+ for the People’s Climate March). In other words, they were really new to the issue they were protesting. The key questions for the resistance now are what happens next to all of these new activists who have become engaged in the last 100 days? Will they stay engaged? What will they do? Will they come out to vote in the mid-term elections in 2018? In terms of my research, there is no question that I will continue to field teams of researchers to study these large-scale events when they happen. The jury is still out on the tablets.